A Antique Victorian Mahogany Twin Pedestal Partners Desk of fine quality. Dating from the mid Victorian period c1860-1880 and having a recent tan and gilt tooled leather writing surface inset into the cross-banded top. Eight graduated drawer front elevation with carved frieze linking the two pedestals. The rear having two shelved also linked by a carved frieze. Original turned wooden handles and full set of matching "Chubb" locks with keys (serial number 559805). Panelled sides. 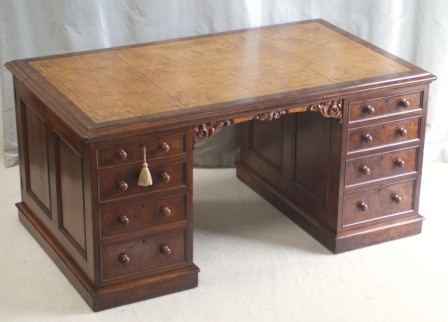 This desk formally resided in a country house in North Essex. Note: the Chubb lock serial numbers can be traced through the Chubb Archives. This particular number relates to locks made during the period 1838-1882 at the Chubb Horseley Fields factory in Wolverhampton. Eight graduated drawers and two cupboards - three piece construction - two pedestals and top.